U.S. President Donald Trump met Prime Minister Benjamin Netanyahu to sign a presidential proclamation officially recognizing the Golan Heights as Israeli territory drawing a storm of global anger. 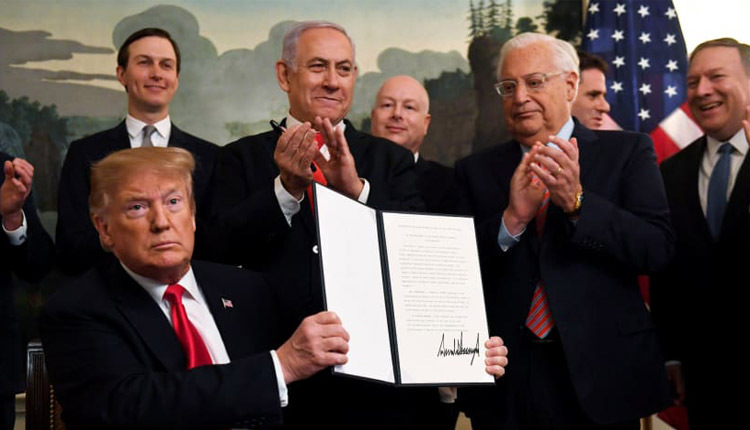 On his Tweeter account Trump said that “After 52 years it is time for the United States to fully recognize Israel’s Sovereignty over the Golan Heights, which is of critical strategic and security importance to the State of Israel and Regional Stability!”. Syria’s foreign ministry called the decision a “blatant attack on the sovereignty and territorial integrity” of Syria. The move by Trump caused an instant international uproar of protests. After the Trump tweet, a European Union spokesperson in Israel said that the EU will not change its position regarding the Golan Heights in the wake of U.S. President Donald Trump’s declaration. Representatives of Russia, Turkey, multiple actors in the Arab world including Palestinians and Syrians also condemned the move.